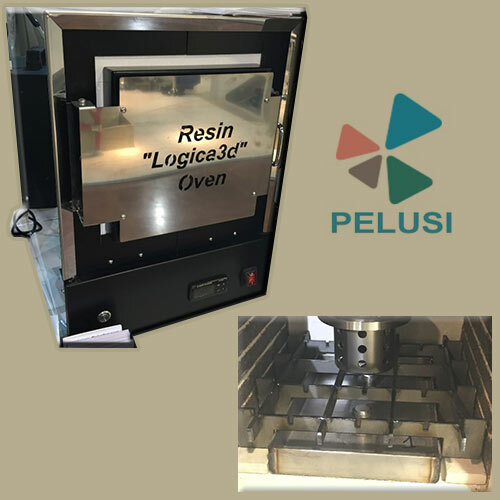 The electric LOGICA3D OVEN has an important function, it was created to achieve the best results during the specific process of BURNOUT of RESIN PATTERNS. LOGICA 3D is automatic advanced technological machine. The programmer regulates the temperature at different values and time, automatically regulated by the electronic programmer 8 programs at 6 steps. Special thermal steel grid and special collecting thermal steel tank for residues. The most important and exclusive feature is the internal oxygenation of the chamber generated by two nuzzles which automatically placing oxygen. The two nozzles enter oxygen inside the chamber improving the resin elimination. This is very important because the resins are not pourable like traditional waxes . The resins have a different reaction to the heat than the waxex. LOGICA 3D lavora automaticamente con un ciclo logico programmato. Start a tempo programmabile 999 minuti. Il consumo ridotto di 1200 watt permette anche al piccolo laboratorio di poterlo utilizzare senza variazione di capacità di corrente all'ente di distribuzione di elettricità locale. Dimensioni muffola 200X200X200 H mm Capacità 6 cilindri diam mm 80 altezza max 150 mm. Potenza massima 10°C minuto a vuoto. Esclusivo sistema di Ossigenazione a due bocche (ugelli) indispensabile per il burnout delle resine.